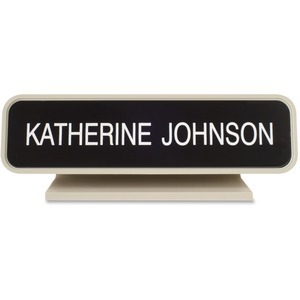 Designer desk sign is perfect for any front counter or office desk in offices, courthouses, schools and warehouses. High-quality plastic desk sign with rounded corners has been engineered as a quality interior sign system and features a distinctive professional look that matches any modern office environment. Choose from more than 35 fonts and more than 30 plastic insert colors. Contact customer service to customize your desk sign.